Here is a roundup of the 2018 Nikon D7200 Holiday Deals & Sales, along with Black Friday, Cyber Monday and Green Monday Nikon D7200 deals, sales and rebates. Whether you’re a passionate photographer or videographer looking for a tool to ignite your creativity, a pro in need of a nimble second camera or someone looking for an ideal blend of versatility and convenience, the Nikon D7200 is ready for your challenge. Shoot in nearly any light—from dawn until after dusk—and capture everything from sports and action to wildlife and everyday moments. Highly Recommended! So, just get this excellent camera this holiday shopping season! This page will be updated when new deals available, so bookmark this page and check back often for the latest Nikon D7200 Black Friday/Cyber Monday/Green Monday/Holiday Deals. See also: Nikon Black Friday & Cyber Monday Deals. $300 off on Nikon D7200 body: $796.95 at Amazon, B&H, Adorama. 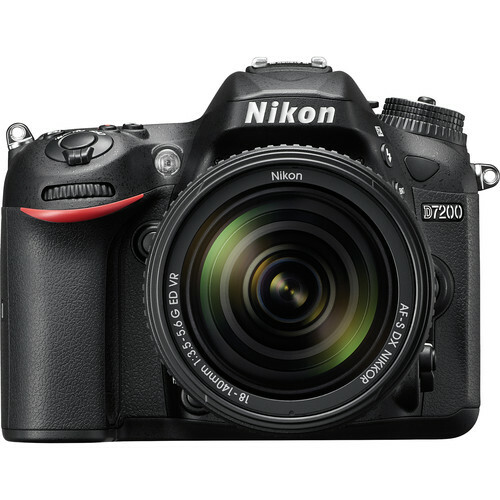 $500 off on Nikon D7200 with 18-140mm Lens: $1,096.95 at Amazon, B&H, Adorama. $550 off on Nikon D7200 with 18-55mm and 70-300mm Bundle: $996.95 at Amazon, B&H, Adorama. Read more: Nikon Black Friday Deals 2018 and Best Lenses for Nikon D7200. Reminder: We are getting ready for Black Friday Camera Deals and Cyber Monday Camera Deals, you can check all Nikon Black Friday Deals here. Read more: Black Friday & Cyber Monday Camera Deals.